A Vietnamese woman accused of assassinating the North Korean leader's half-brother is to walk free after Malaysia dropped murder charges against her this morning, weeks after her Indonesian co-accused was also released. 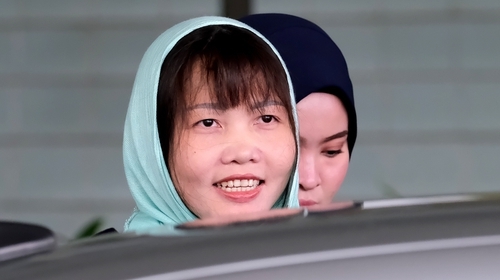 The 2017 killing of Kim Jong-nam with a toxic nerve agent at Kuala Lumpur's international airport shocked the world, but Doan Thi Huong's guilty plea to the lesser charge of "causing injury" makes her the only person convicted in the case. Malaysia allowed the two women's suspected North Korean handlers to leave in the days after the murder, amid a furious diplomatic row as South Korea accused the North of plotting the Cold War-style hit. But last month the charge against Indonesian suspect Siti Aisyah was dropped and now prosecutors have withdrawn the charge against the second accused, Doan Thi Huong from Vietnam, and replaced it with a lesser one. She pleaded guilty to "causing injury" and was handed a three year and four month jail term, with her lawyers saying she would be freed next month due to sentence reductions. While there was relief for Huong, the outcome means her conviction is the only one over the sensational assassination of Kim Jong-un's estranged relative, who was seen as heir apparent to the North Korean leadership until he fell out of favour. Huong, a 30-year-old former hair salon worker who had been living a precarious existence among Malaysia's army of migrant workers before her arrest, said she was "happy" after the verdict was handed down. "This is a fair sentence," she told reporters at the High Court in Shah Alam, outside Kuala Lumpur. "This is a fair judgment, I thank the Malaysian government and the Vietnamese government." Her father Doan Van Thanh, who was at court, said he planned to "host a big party to welcome my youngest daughter back home". Days after Aisyah's charge was dropped, prosecutors announced that the attorney-general had rejected a request to withdraw Huong's murder charge, prompting her to break down in floods of tears in court. During the women's long-running trial, which began in October 2017, the court was shown CCTV footage of them approaching Mr Kim as he waited for a flight, one of them placing their hands on his face, and then both of them running to bathrooms before fleeing the airport. In the run-up to the killing, the North Koreans who befriended the women got them to practise smearing harmless substances on people's faces in public locations in exchange for money. The women's lawyers said the real masterminds were four North Koreans who were seen at the airport on the day of the murder meeting the pair, and fled after the assassination. The four were charged in absentia along with the women over the killing. The assassination also sparked a furious row between North Korea and Malaysia, previously one of the nuclear-armed North’s few allies, and prompted both countries to expel each other's ambassadors.